The self-titled 'Godfather of Start-up Loans' has taken to Twitter to talk about Startup Britain's new initiative for budding young entrepreneurs. 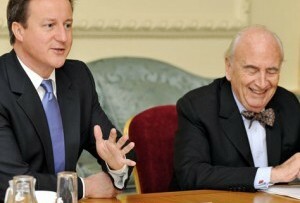 David Cameron's advisor on enterprise, Lord Young, has taken to Twitter to throw a little light on 'Startup Loans'. Business and enterprise minister Mark Prisk announced the pilot last month, saying only that private sector partners had been sourced and that the funds would be accompanied with mentoring and training for successful applicants. Further details on the initiative have been rarer than hen's teeth so far, but Lord Young has now revealed that the project will kick off on May 28, with £10m worth of loans of up to £2,500 each up for grabs. These loans, championed by the likes of Richard Branson, have been pitched as an alternative to university for bright young things. The message is clear: if you have a good business idea, don't spend £9,000 a year on further education, get a wedge of cash to launch your venture instead. Applicants must be between the ages of 18 and 25 to be eligible for a loan, and must present their ideas to a panel in order to qualify for the money. No one from Start-up Britain was available to confirm whether these loans would be interest-free at the time of writing, however.